I love food – good food, flavorful food, color food and aromatic food. I’m not a fan of raw onions…they make me gag, actually – same with raw broccoli. I also love the smell of food – even onions, I love the color of vegetables – even broccoli; and I’m convinced that any conflict probably could be resolved with food. I know… probably naive. Because of this love of food, reading The Book of Unholy Mischief was really enjoyable. It may sound like an exaggeration, but I actually contemplated cutting open an onion, closing my eyes and tasting it…you know, like try to taste it for the very first time without the childish knowledge of how it tasted when I was five. When push came to shove, I couldn’t do it…but I thought about it, and that for me is like winning 1st place in the Next Food Network Star competition. By the way, I did try Shallots recently…and LOVED the way they smelled (raw) and tasted with my roasted potatoes. This is the world Luciano lives in. Luciano resembles Charles Dickens’ Oliver – only Italian, not English. Eventually, Luciano is caught stealing by a chef and given the job of Chef’s Apprentice in the palace kitchen. He’s already fallen in love with a convent girl and is fiercely loyal to his street buddies. The catalyst for this story is a book. In this book, there is supposed to be a recipe for making gold (something the street boys want), recipe for immortality (something the Doge* wants and is willing to kill everyone over), and a recipe for undying love (something Luciano wants so his convent girl will love him). There are said to be recipes for getting your most desired wants. If the book is the protagonist, then these three mentioned recipes would be the antagonists. Over the course of the story, we find out the book is nothing like what people think it is. It is a recipe book – just not like what Venice gossip-mongrels thought it was. And yes, its hidden; but its also in plain sight. Its an alchemy book of sorts – in today’s world we’d call it a cook book, and those that are sworn to protect it would protect it with their lives. 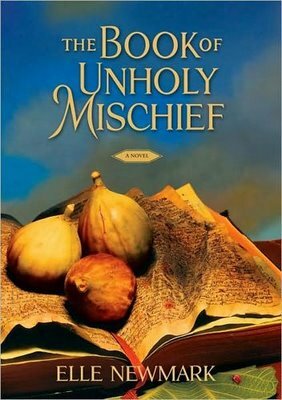 I loved the amazing detail of The Book of Unholy Mischief. I felt like I was walking through the markets in Italy; I saw the architecture, I smelled the fresh food, I felt the heat coming from the kitchen where much of the story takes place. I could see the vibrant color of the vegetables. I smelled the spices and marveled at the intricacy with which the Chef put together his dishes for the visiting dignitaries. I wanted so badly to taste the dishes the Chef was making just to taste the real power of his creations. Newmark nailed it with the historical descriptions of 15th century Venice and amazing food descriptions. Ultimately, my enjoyment of this book came from the complexity of why the book had to be kept a secret until a later time; who was supposed to keep the knowledge it contained. I loved the conflicting ideas it contained versus what was the accepted level of understanding of the times. I loved the use of food to create or dissipate conflict during a meal. I found the idea of food being a powerful contributor to how a group of people react in a situation a wonderful concept (and one I believe it possible). There’s a great deal of intrigue in The Book of Unholy Mischief, though sometimes it doesn’t appear to be thought out to the logical end. I got the feeling the author was really trying to draw our attention to the old dungeons under Venice, but I couldn’t figure out why there were so many references. There was vague action around these dungeons, but the plot never really went inside. I suspect the references to the dungeons were used to give us a sense of intrigue, mystery and the ever popular sense of violence that comes with knowing about a place where methodical torture takes place; but for me, the references to the dungeons only confused me. I thought the constant reference to the dungeons was a foreshadowing technique, but it never happened. I wanted to like Luciano. I gathered pretty early this was a type of “coming of age” period for him, but instead of enjoying what I was learning about him, I wanted to know more about his Master Chef. Luciano seemed incredibly naive for one that grew up in a brothel and then was kicked out on the streets. Luciano was really sort of a conflicted character for me. One the one hand, he was motivated to try to make his own culinary creation to impress the Master; and there were several references to him trying to figure out what went with what. On the other hand, there was more bitching and moaning and sneaking around than there was him actually doing any preparation and truly learning. I got that he was a student and the Master chef was teaching him more than just what you need to know to cook. He was teaching him to be a master chef. I got that. I just felt like the whining was a bit much. Another problem I had with Luciano was that I got the impression he had developed the ability to be stealthy during his time in the streets. I got more of a sense that he was sneaky rather than stealthy. There is a balcony scene where he is eavesdropping on the chef and his wife under the cover of darkness, and he appears to be on the verge of getting caught. The problem I had with this was, I’ve seen the architecture of residences in Italy and the balconies aren’t very big. The description of this scene made it seem like there was all sorts of space for him to navigate around. If he were on any of the balconies I saw in Italy (and I admit, I didn’t go to Venice), he’d have been caught. It just didn’t really make sense to me. A stealthy kid would have had enough sense to understand he would have been caught and found another way. A sneaky kid would have tried it and hoped to hell he didn’t get caught – which is what Luciano did. Luciano just didn’t appear to put two and two together in many areas of the story until it was too late. And this seemed a bit tragic to me. I didn’t expect him to be all knowing to the ways of the world, but I did expect him to have some street sense that I am not sure he actually showed. Luciano’s story is one of second chances. He’s given an incredible second chance at life and ultimately, he takes the opportunity and becomes part of the secret society he was offered inclusion in. I’m glad it worked out for him. I do believe throughout the story the reader is able to see tremendous growth in Luciano’s character – in both the literary aspect and the humanity aspect. This sense of growth made some of the other flaws overcome-able, but it still left the question what about this boy made him a prime candidate for the role he would play in life? Despite some of its flaws, The Book of Unholy Mischief is a fun read, definitely thought-provoking, and worth your time…especially if you love food and see it as more than just something we need to survive.